Tobacco use is the leading cause of non-communicable diseases like cancer, heart disease, and stroke. Every year, about six million people worldwide die from tobacco use, with the vast majority of deaths in low- and middle-income countries. We also know that tobacco use costs the world’s economies over US $1.4 trillion annually in healthcare expenditures and lost productivity. But did you know that significant increases in tobacco taxes can curb these losses? A World Health Organization study estimates that a 50% tax increase in all countries would prevent about 11 million premature deaths caused by tobacco use. So, what is it about tobacco taxation that makes it so effective? To help us answer this question, we asked Dr. Frank J. Chaloupka who leads the Tobacconomics Team (@tobacconomics) and is a Distinguished Professor of Economics & Public Health and Director of the Health Policy Center University of Illinois at Chicago to share five key facts about tobacco taxation. Dr. Chaloupka and a new team of tobacco tax policy experts at the University of Illinois at Chicago will be joining the Bloomberg Initiative to Reduce Tobacco Use, with their efforts focused on helping accelerate progress on tobacco taxation. 1. Raising taxes on tobacco works. 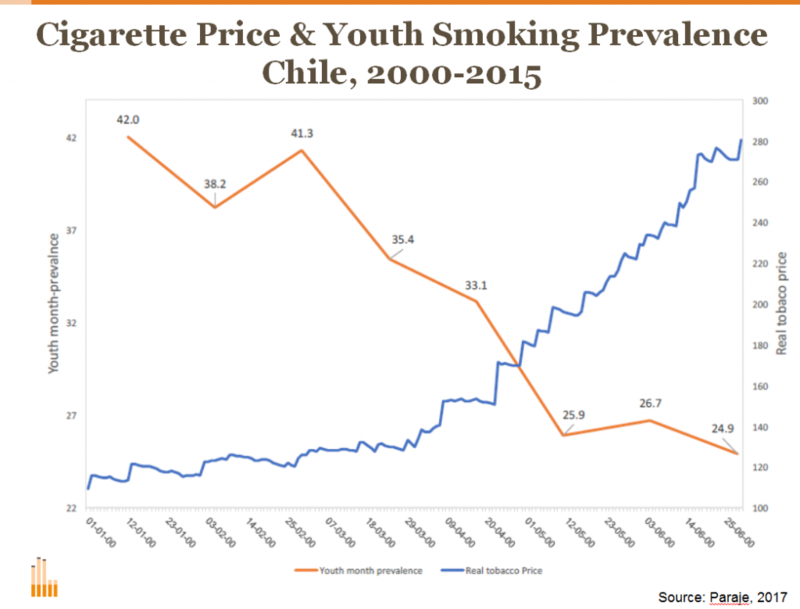 Evidence from around the world shows that higher taxes and prices lead tobacco users to quit; deter former users from restarting; prevent young people from taking up tobacco use; and even reduce consumption among those who continue to use. Decades of research from countries of all income levels consistently show that significantly increasing taxes on cigarettes and other tobacco products is the most effective policy for reducing tobacco use. This finding was most recently highlighted in the U.S. National Cancer Institute and the World Health Organization Monograph (NCI/WHO Monograph) on the economics of tobacco and tobacco control, which reviewed hundreds of studies from around the world. In the Philippines, for example, significant tax increases raised cigarette prices by about 50 percent between 2012 and 2015, reducing cigarette sales by 12 percent. 2. Raising taxes on tobacco benefits the most vulnerable. Tobacco tax increases have the greatest impact in reducing tobacco use among young people and low-income populations, groups that are particularly susceptible to the billions of dollars the tobacco companies spend each year marketing their products. First, young people are two to three times more sensitive to tax and price increases than adults, which means that higher tobacco taxes are highly effective in preventing youth from developing a lifelong addiction. This is particularly important given that nearly all tobacco users start during adolescence or as young adults. Similarly, low-income tobacco users are more susceptible to the damaging health impacts of tobacco use because they often lack access to health care and services. Faced with higher taxes and prices, these users are more likely to quit or cut back on their use of tobacco. Therefore, increasing taxes are an effective way to not only help people in low-income groups to quit, but also to reduce socioeconomic health disparities as their need for increased health care declines. One recent study from Turkey, for example, found much larger reductions in smoking among the lowest income third of the population compared to higher income groups after tax increases, so that a cigarette tax increase would be progressive from both a financial and health perspective. 3. Increasing tobacco taxes generates new government revenues. Despite the reductions in tobacco use that follow tax increases, country experiences across the globe show that significant tobacco tax increases lead to increases in tobacco tax revenues. This happens because tobacco taxes account for only a fraction of tobacco product prices (less than half in many countries) and because the reductions in tobacco use are smaller than the increase in price given the addictiveness of the nicotine contained in tobacco products. One recent study described in the NCI/WHO Monograph found that if all countries were to raise their cigarette excise tax by the equivalent of one international dollar (about US $0.80) per pack, they would collectively receive an additional US $141 billion in cigarette excise tax revenue in the first year following the tax increase. Even after such an increase, tobacco tax revenues would still fall far short of covering the costs of the health care to treat the diseases caused by tobacco. 4. Even smokers support tobacco tax increases! Not surprisingly, a majority of the public supports tax increases on tobacco products. And in fact, most smokers regret ever starting and many try to quit each year, so it makes sense that a significant proportion of smokers actually support tobacco tax increases. In a 2010 survey of 18 European countries, more than 7 in 10 non-smokers and nearly 4 in 10 smokers supported tax increases that raised prices by 20%, with a majority of smokers in Ireland, Spain, England, Sweden, Romania, and Albania supporting the increase. Support for tobacco tax increases is even higher when some of the new revenues are used to support tobacco control and other health promotion efforts. 5. When revenues from tobacco taxes are used for tobacco control, tobacco use declines even more. A key best practice in tobacco taxation is to invest the new revenues from tax increases into tobacco control programs and other health promotion activities. Several U.S. states, beginning with California in 1989, have earmarked a portion of the new revenues from a tobacco tax increase to comprehensive tobacco control programs that include educating the public about the harms from tobacco use, enacting and enforcing smoke-free environments in public places, supporting tobacco cessation counseling and products, and more, resulting in even larger reductions in tobacco use than those resulting from the tax increase alone. Since 2001, Thailand has funded a health promotion foundation using revenues from a 2% surcharge on tobacco and alcohol. In the Philippines, most of the new revenues from the tobacco and alcohol tax increases implemented over the past few years are used to fund a national health insurance program providing access to health care for low-income Filipinos. To summarize, raising tobacco taxes is a ‘win-win-win’ policy. First, significantly increased tobacco taxes lead more people to quit tobacco, promote public health, and increase economic activity by reducing the lost productivity caused by tobacco use. Second, higher tobacco taxes generate significant new revenues that governments can use to support health and development objectives. Third, tobacco increases are popular with the public, including many tobacco users, and even more popular when some of the new revenues are dedicated to tobacco control and other health promotion efforts. The evidence is clear – it’s time for governments to significantly increase tobacco taxes. If you want to learn more, join us for Bloomberg Philanthropies’ new Facebook LIVE series “The Big Idea,” where in our first episode Thursday, February 23, at 4:30 p.m. ET, we’ll be joined by Dr. Chaloupka and our public health team member Jo Birckmayer to discuss The Big Idea behind tobacco taxation. This post was originally published on the Bloomberg Philanthropies blog.